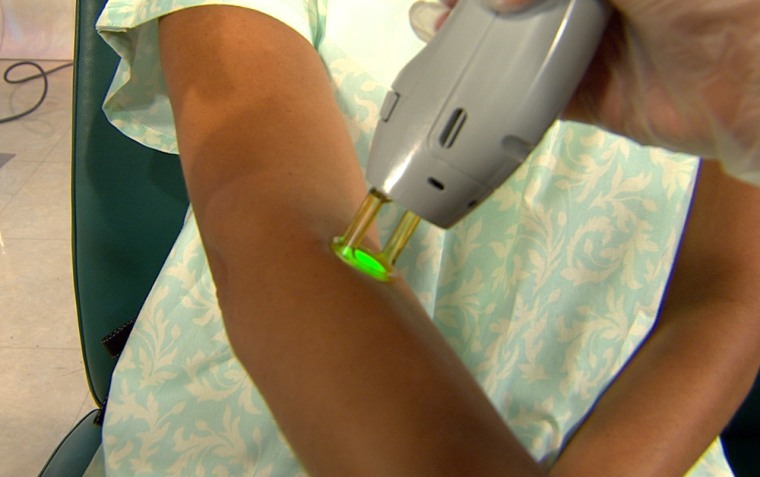 After seeing Kathie Lee and Hoda get lasered and lifted, live during the fourth hour's special "Needles, Knives or Nothing" show, you sent us your questions on Facebook about laser hair removal. You wanted to know about skin tone, cost and effectiveness, most of all. Dr. Jeanine Downie, a dermatologist who also specializes in sclerotherapy, has your answers! A. It depends on how thick your hair is and where it is on your body. Hormonally mediated areas (upper lip, chin) can take longer than legs as hormones influence hair growth in these areas. Typically, it is 14 treatment sessions with three months off and then six treatment sessions with six months off for people to see clearing. Each person is different. Bottom line: Laser hair removal takes years, and judging from how popular it is, it's worth it. A. It is very effective for olive to dark skin, which is my skin tone. You must seek out a doctor who has a machine that is safe for darker skin types. Usually I recommend the Lyra by Cutera or the Gentle Lase by Candela. I would need to see you to evaluate you, but just make sure the doctor is board-certified and has other laser patients that share your complexion. A. Get the treatments done with a board-certified dermatologist that you were referred to, preferably by a friend or family member who has used them. With pricing, you get what you pay for! Watch out for the bottom-feeders! A. No, there is no 100% pain-free anything with any cosmetic procedure. I think it stings, but is worth it. I have men in my practice that tear up in pain and others that feel nothing. A. Laser is unreliable on blonde hair. Patch test on one area for four months before you decide. Otherwise, threading, waxing and sugaring all work. A. Laser hair removal is permanent; electrolysis is not. Both take forever and electrolysis is more painful, too. Have you ever 'overdone it,' beauty-wise?